It keeps running through my head–the great Marvin Gaye asking, “What’s going on?” This was a 1971 antiwar and social justice song, but the question applies to the war on animals, as well. “Don’t punish me…with brutality…what’s going on?” If you know the song, chances are good it’s in your head now, too (you could do worse). If you don’t know it, there’s always You Tube. The RSPCA in Great Britain reports that, in a five year period, reports of animal cruelty have surged 66%. “Unfortunately, there are a lot of people out there who just don’t see animals as living creatures, they see them as an object…” said one RSPCA inspector. Imagine that, seeing animals as objects. Given human greed and the voracious appetite of corporations for more and more, it’s easy to understand why the sentient individual is out and the production unit–times x billion–is in. The commodification of animals steams ahead with genetic manipulations designed to reap ever more profit for corporate factory farms. Animals are good as gold, fueling billion dollar industries like horse racing. How many foals are bred and destroyed in pursuit of the next Triple Crown winner? Who cares? See you in the winner’s circle! Are we seeing the fallout from generations raised on ever more realistically violent and dehumanizing video games? Are we witnessing the result of ever greater alienation from once-nurturing families and communities? Are heinous acts against the defenseless meant to reassure us that–in a world where we are increasingly powerless–we still have some power, even if over “only” an animal? Has this amount of cruelty always been with us–but now, in the instant information age, we are simply more aware of it? I know when to admit that I’m in over my head, without answers, sad and baffled. This is when we turn inward to examine the dark reaches of the human psyche and ask, what’s going on? 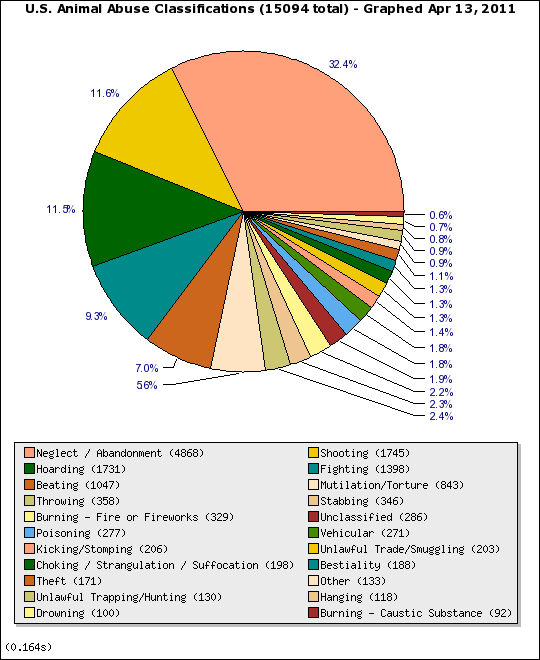 To see a pie chart for your own state, visit Pet-Abuse.com. great article. you ask some very pertinent questions there in the last paragraph that, i think, point to some major sources of animal abuse. job well done. As with any news, particularly crime I always wonder if it always was this way – Or has our ability to report and document these thing made them appear on the increase? Either way, I have my own theory as to why humans are so terribly brutal to the innocent. It’s jealousy. In most ways nonhumans are the most privileged of us all. They have no understanding of their deaths, therefore can live blissfully in every moment of true happiness. They are also perfect and complete in that they don’t “need” the trite and constant gratifications that humans do. Nonhumans are the most pure because they simply are what they are without ruse or lies or deceptions. Finally, I also think that in our own hurried, human petty-driven lives we’re basically unhappy and unfulfilled – Under the burden of constant worry over nonsense… It is easy to take these frustrations out on victims who are already silenced by nature and by society. One thing is for certain, we’ve a heck of a task to turn things around to any point of justice. The research out of the UK is very worrying. One might hope that the increase was due to more awareness and reporting of cruelty cases rather than an increase, but the RSPCA seems to think otherwise.